First things first, remove the battery to start. 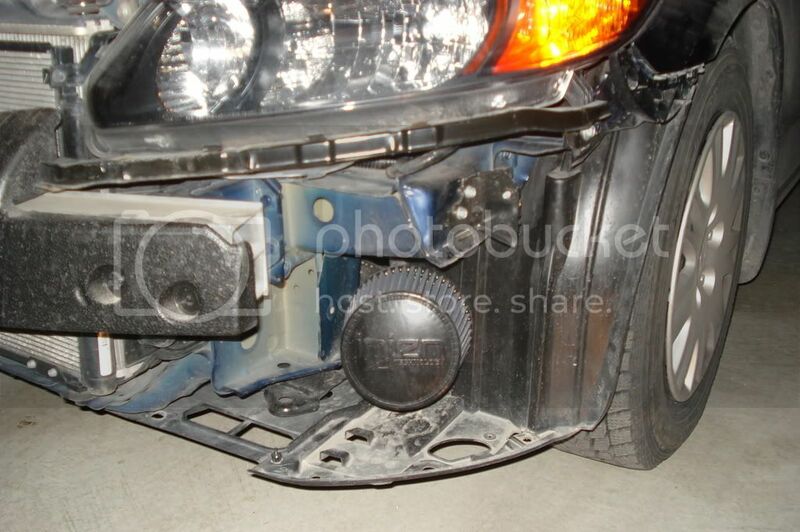 Then its time for da bumper. This is an easy remove - just unscrew the four philips screws, located in da pic below, and then remove the plugs from the bottom. The trick to removing the plugs is to loosening the middle of the plug,come out about half way, and then the whole thing snaps out easily. 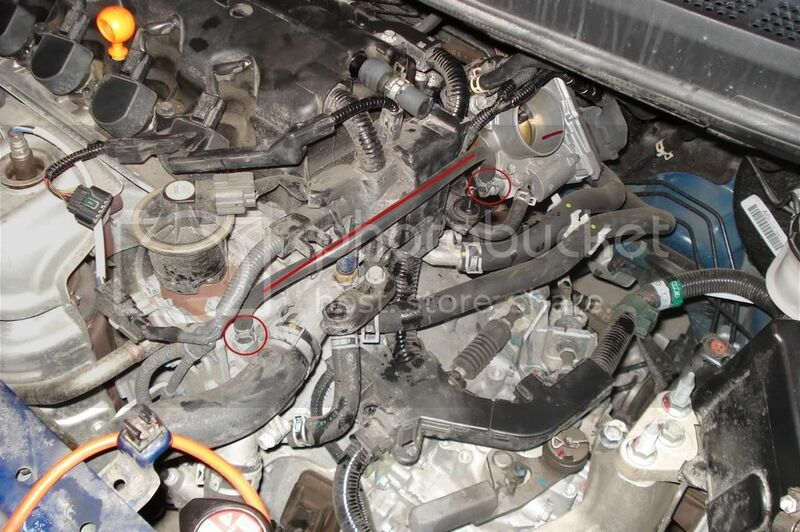 The resonator will come out later, you can loosen the bolts for now, ure choice. This is where you will really need the socket extension! 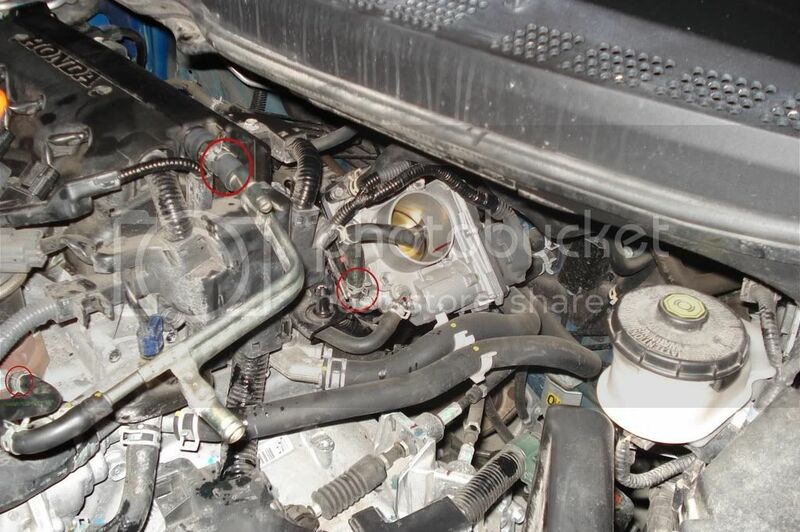 Next undue the 4 clips holding the top of the air intake box and remove it. 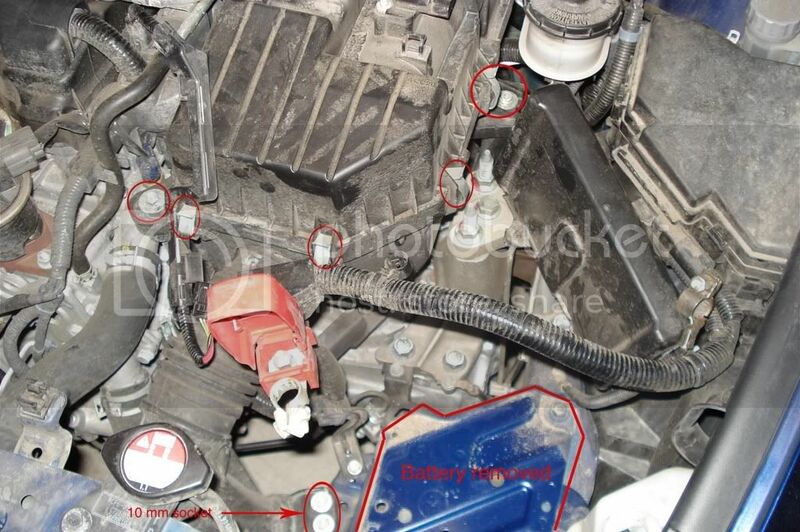 Then the 2 bolts that hold down the bottom part of the air intake box and the 2 bolts holding the intake hose to the battery tray. Gently remove the top part of the box and then the bottom part. 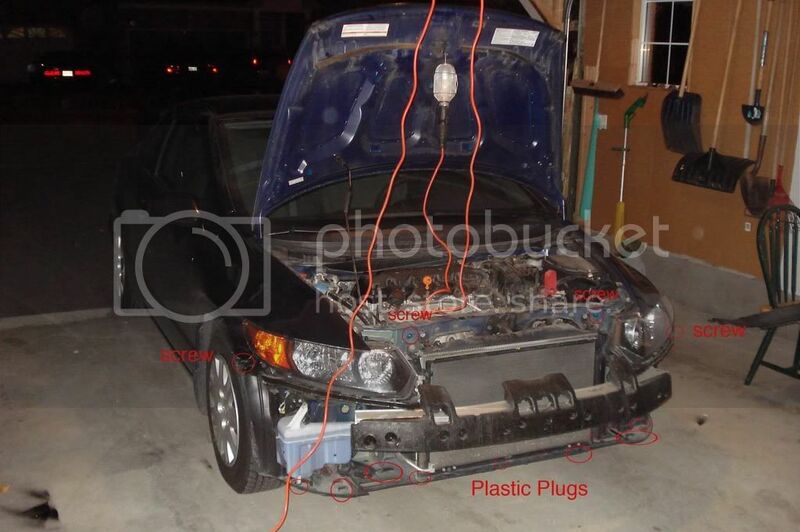 Dont forget to about the plug holding the bottom part down aswell. Just gently lift it off. Here you can see the plug I was talking about. 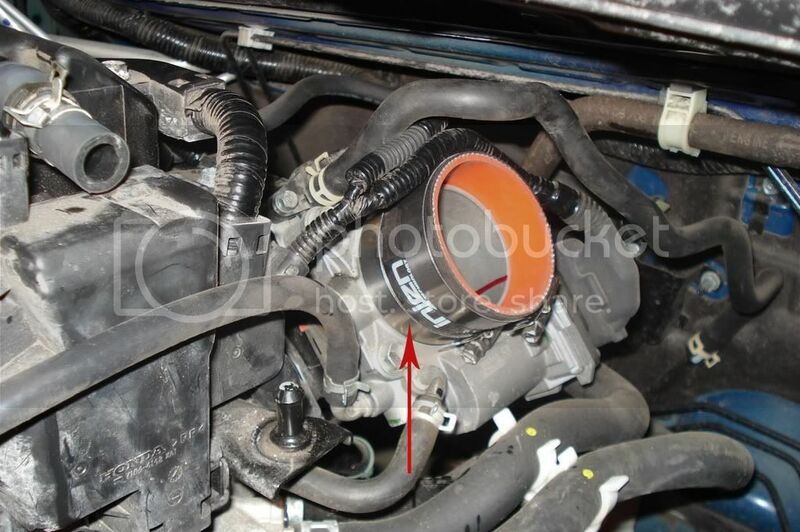 Now loosen the clamps holding the short air intake duct onto the throttle body and remove it. Then put on the first vibra mount. Now go back to the resonator and remove the 2 bolts holding it in place. Gently remove it and in place of the outther bolt place on the second vibra mount. Then get out your choice of cutting tool and cut out a nice chunk of your cover to make room for da lower part of the intake. Next remove the PCV. 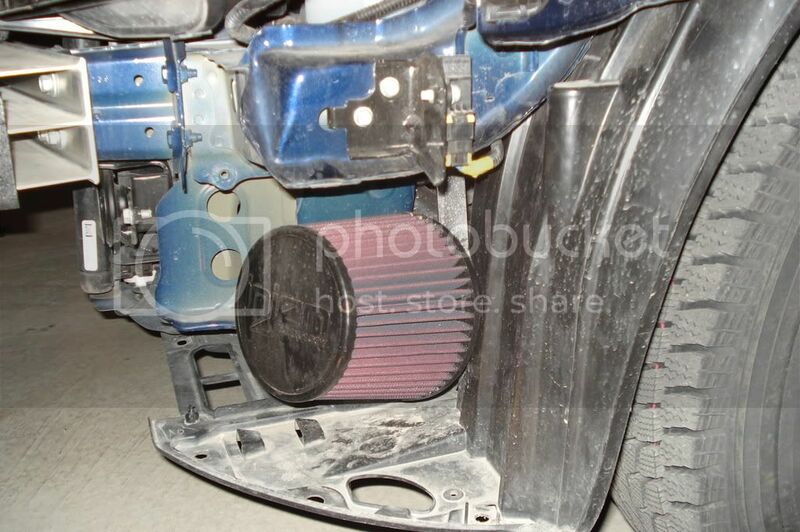 Easily done by releasing the clamps shown in pic below and thats that. 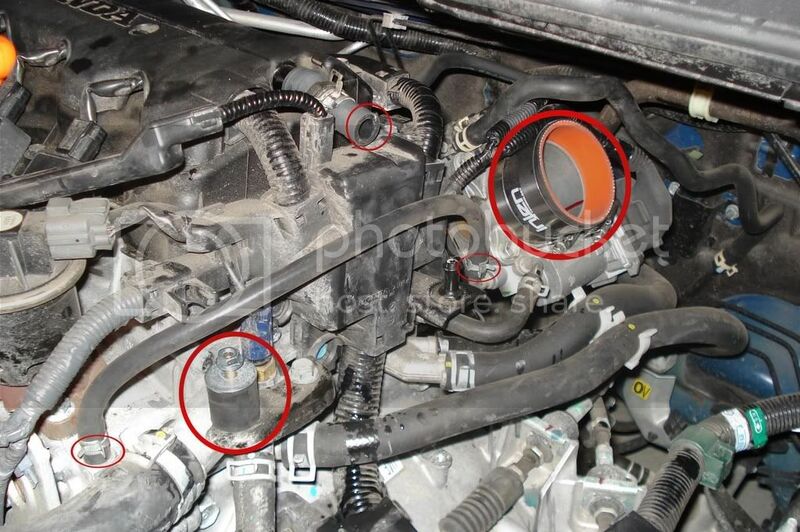 Now take the 15" - 6mm hose (provided) and connect it from the throttle body to the upper coolant outlet; as shown in the pic below! 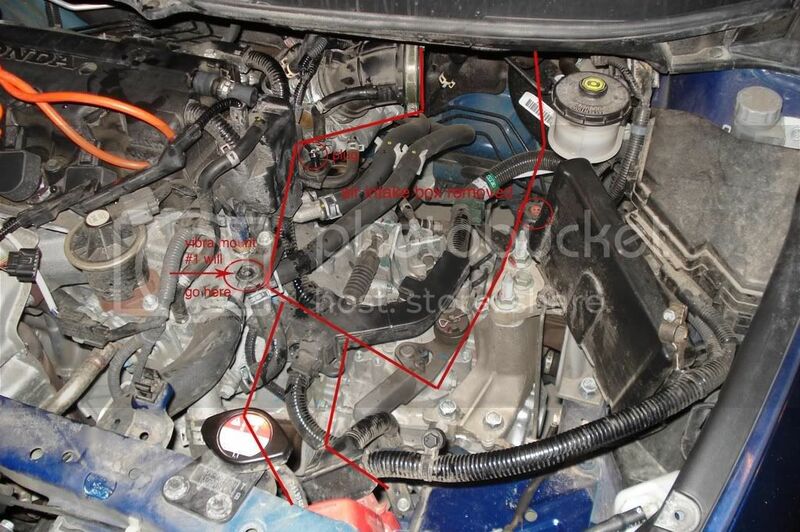 Now place the straight hose onto the throttle body. *some come with the 2 clamps on the hose already and some don’t, so just do it yourself if it doesn’t!! This was my first anything, so I laid most things out to help with the putting back part for the things that will go back on - which is not much at all but the visual is still good if your learning, like me! 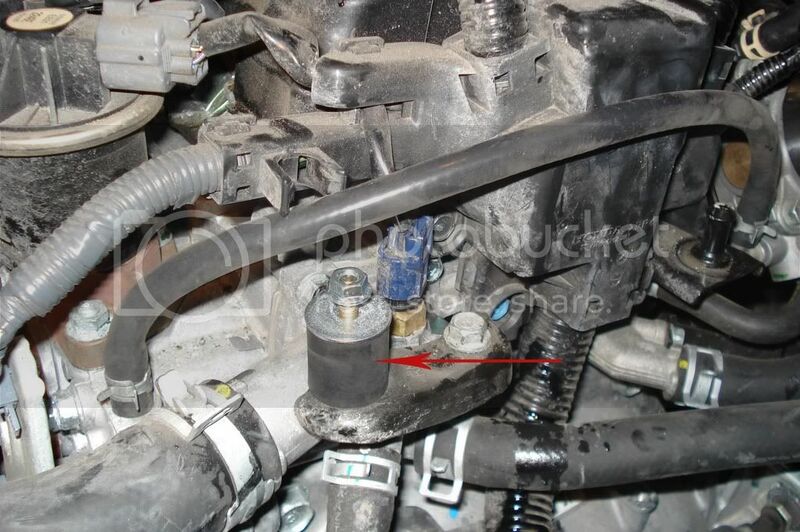 vibra mount and 15" hose... you can see i let the coolant spill out when I took the PCV off... avoid this! Just a pic of the few spots covered so far! 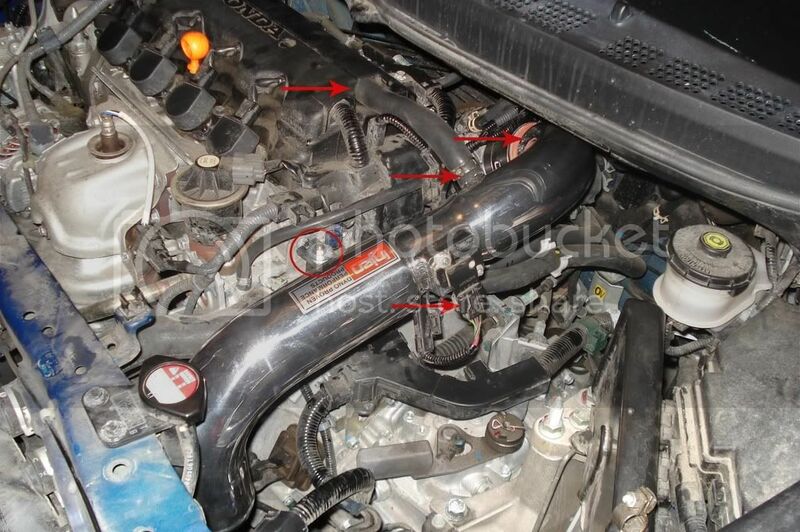 The hose coming from the crank case can also come off at this point or u can do that when your putting on the 6" - 17mm hose that connects to the new intake. Take the mass air flow sensor off the top of the air intake box by unscrewing the 2 philips and place it into the top of the CAI as shown. 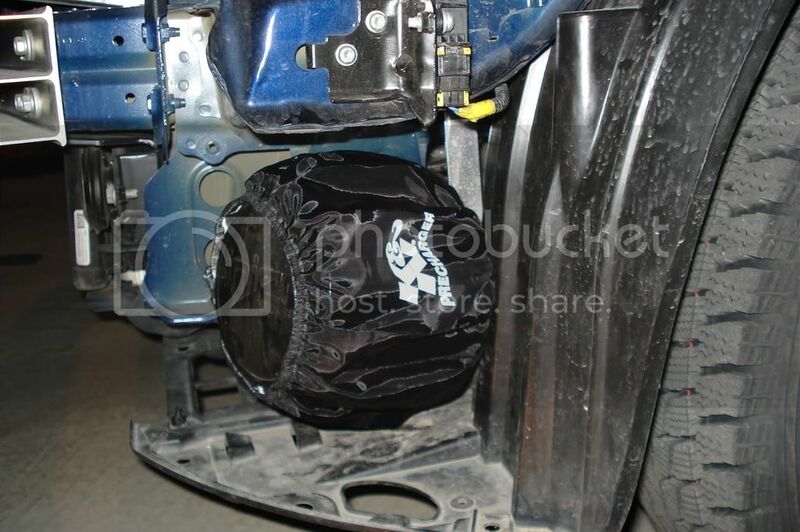 Now take the top portion of the intake and insert it into the 2 1/2" straight hose and tighten the clamps a bit. 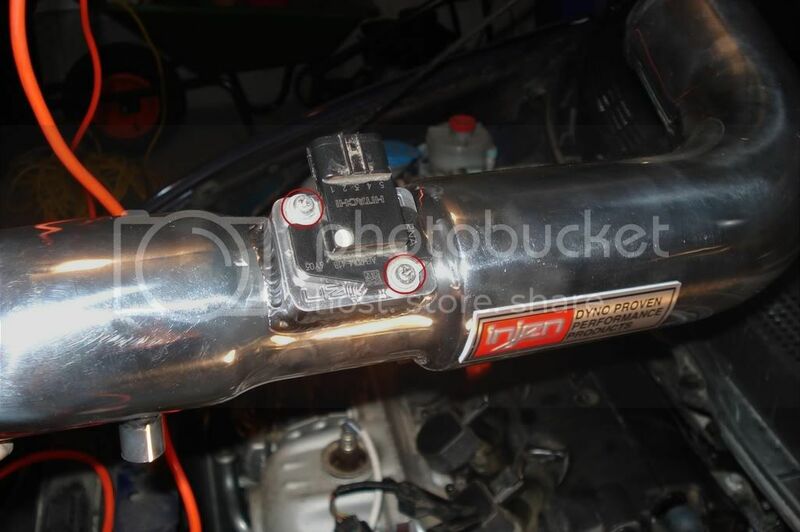 Then take the 6" - 17mm breather hose and connect it from the crank case port to the intake port as shown below. 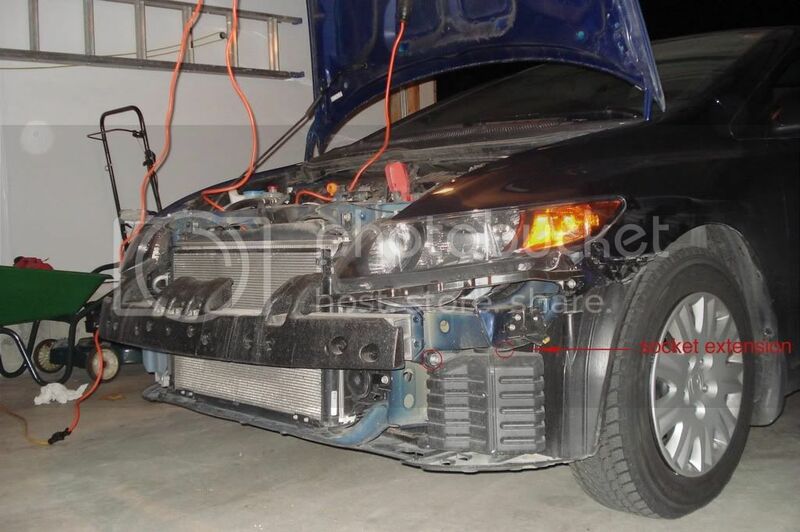 Next clip in the harness into the air mass sensor and tighten the intake to the vibra mount. At this point all there is left is to take the bottom part of the intake, with the 3" straight hose tightened onto it, and push it through your precut hole and connect it to the top half of the intake. Then tighten the 2nd vibramount and put on the filter. 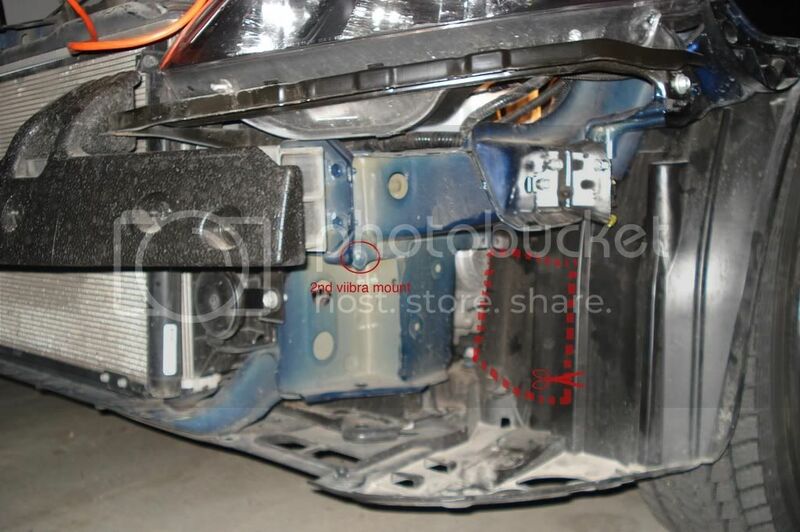 Place the bumper and battery back and you are DONE!! It says this install takes 1.5 hours, Iam assuming thats with some knowledge and experience!! so that should help you get an idea of how long the install will take. Last edited by pitbu11; 22-Dec-2007 at 12:58 AM. 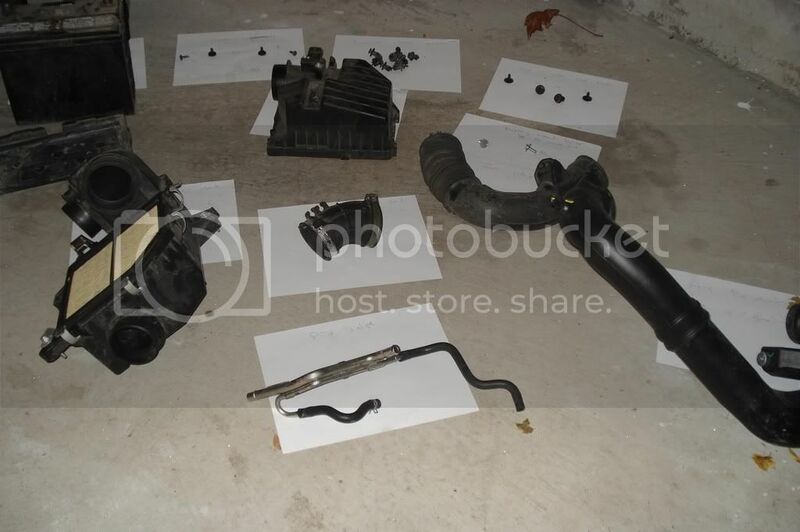 FS: Beaks, ITR Bars, Mounts, AEM BBK, Injen CAI, Floor Bar, etc. FS: 03 SIR SEATS, 17" RIMS, INJEN CAI, DECK, EXHAUST, HEADLIGHTS, etc etc!